Residents and business owners throughout Lancaster County are enjoying the benefits of generating electricity with solar panel systems. Installing solar panels on your roof is a smart and solid investment. 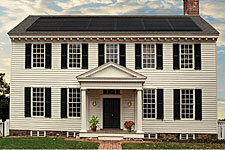 Solar panels lower your monthly energy bills and increase the value of your home. Solar is even more accessible now through generous federal and state rebates and tax incentives. These solar panel installers are locally-owned and offer free estimates. Joyland Roofing, a GAF SolarElite Contractor, is reimagining solar rooftops. Homeowners and General Contractors already trust Joyland Roofing for our superior service, now we want to fortify that trust with our superior DecoTech Solar Rooftops. DecoTech’s sleek design is integrated into the roofing structure. Visit our website to learn more. Sun Lion Energy Systems, Inc.